Ghost Hunters International is back on Jan. 6th with an all new investigation. This time the team heads to the Gran Hotel Viena in Miramar, Argentina. The history of this structure begins with a German named Max Pahlke in 1904. They traveled to Argentina in search of work. Max met and married an Austrian woman named Melita in Uruguay about ten years later. The couple had two children, Max Jr. and Ingrid. His wife Melita suffered from bad asthma and his son Max dealt with psoriasis. Seeking relief from their ailments in Europe was rather dangerous due to World War II. Doctors suggested they visit Laguna de Mar Chiquita due to their curative baths and mud applications. The family took a trip to this location in 1938 and stayed a couple of weeks. They participated in healing treatments, balneotherapy, and mud therapy. After returning to Buenos Aires, that winter, Max noticed an improvement in his wife and son's health. What are your Anti-Resolutions for the year 2010? You have 9 days to submit to the Ghost Stories Carnival January edition. Your submission must be in by 11 pm Central. Pick your best post between December 2nd and January 4th and submit it. No registration required. Must be paranormal related. I kick myself for not taking the chance to visit the wonderful place when I had the chance. My dad lived in St. Louis, MO and I often visited him during the summers. If only I had developed my taste for the paranormal as a teenager, I could have seen this structure up close. Lemp Mansion is certainly a Victorian showplace displaying the rise and tragic fall of a brewery dynasty. Johanne Adam Lemp traveled to St. Louis from Eschwege, Germany. He sought his fortune as a grocer, providing one unique item no other store contained - lager beer. Lemp used his father's recipe and the natural cave system under St. Louis to accommodate his customers demands until abandoning the grocery business two years later and building a modest brewery. His dreams of fortune came true. John Adam Lemp died a millionaire on August 25, 1862. Christmas Traditions: Fact or Myth? Fact: Oliver Cromwell banned Christmas Carols between 1649 and 1660 in England. He thought that Christmas should be a very solemn day and therefore banned carols and parties. The only celebration was by a sermon and a prayer service. Myth: Rudolph lived with Santa at the North Pole and was one of his original reindeer. Actually Rudolph was discovered by Santa while he was making his Christmas delivery to his home. The story of Rudolph was written in 1939 by Robert May, an advertising copywriter for Montgomery Ward in Chicago for promotional reasons. Fact: Some priests in Australia advise you to say "Happy Christmas", not "Merry Christmas", because Merry has connotations of getting drunk. The land in which this is national historic landmark sits upon was sold to Erastus and Sarah Reed, who left Georgia for Texas, on April 23,1859 by John James for $200. The couple built the center portion of the inn bringing the Southern Colonial architectural style to the Texas Hill Country. During these days, there were no hotels available to travelers, leaving them at the mercy of homeowners willing to share their spare rooms. The Reeds were the first to begin this hotel tradition, offering four rooms for those traveling through Texas Hill Country. Ranchers used the surrounding grounds as a wagon yard and penned their cattle in what is now the cities main plaza. The Old Reed House was also Boerne's stagecoach stop. Was Jesus Christ really born on December 25th? A number was pulled from the virtual hat. The winner is....Commenter Number 1, Susie! Thanks for all those who entered. What do you get when you mix a piece of American history, ghosts and children? 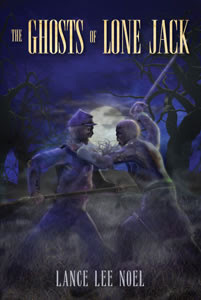 The Ghosts of Lone Jack By: Lance Lee Noel.Jared Milhouse spends what seems like a quiet summer at his grandfather’s farm in Lone Jack, Missouri. A chance encounter with a female spirit during the tail end of a baseball game changes his life forever. With the aid of his acquired new friends of the Crossroads Club, his dad, grandfather, two town eccentrics and a couple of amateur ghost hunters, he explores the story of one of the bloodiest battles in the Civil War and looks for the key to release the town from a decades old curse.